One aspect of the oil supply to the top end of the engine which seems to be overlooked is the oil distribution to the spindles on which the cam, double gear &, in the case of a gear drive engine, the intermediate gear rotate. Oil is fed from the oil pump via the steel tube cast into the timing cover to the end of the crank. 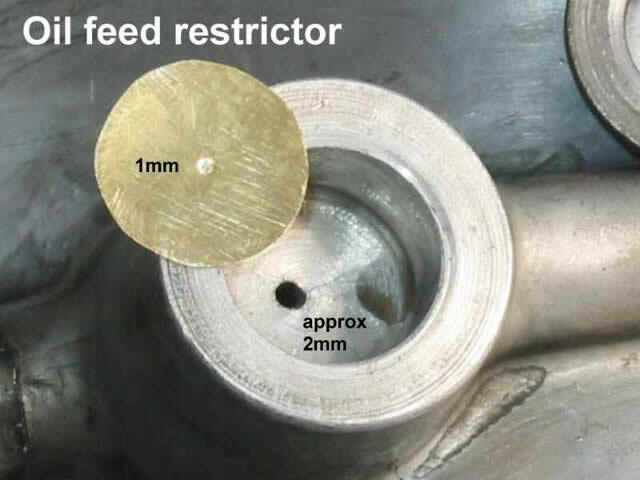 A restrictor on the crank end diverts excess oil up the tube to the aforementioned spindles which are fed via drillings in the casing which pierce the supply tube. Oil flows into the spindle ends & out, via cross drillings in the spindles to the rotating gears/cams/chain sprockets. Oil not fed to the spindles is fed, via a restricted union, to the rockers. The familiar T-shaped oil feed pipe has 3 x 8mm banT-shaped each of which has a restrictor drilling of approximately 1mm diameter. The function of the restricted banjo bolts is a matter for discussion. In a world where oil pressure & flow from the pump was high they would indeed restrict the flow to the rocker gear to an adequate level. In the real world we have low pressure & flow. In this case the restrictors actually prevent the oil from taking the route of least resistance & in doing so prevent the crank & cam from being starved of oil. 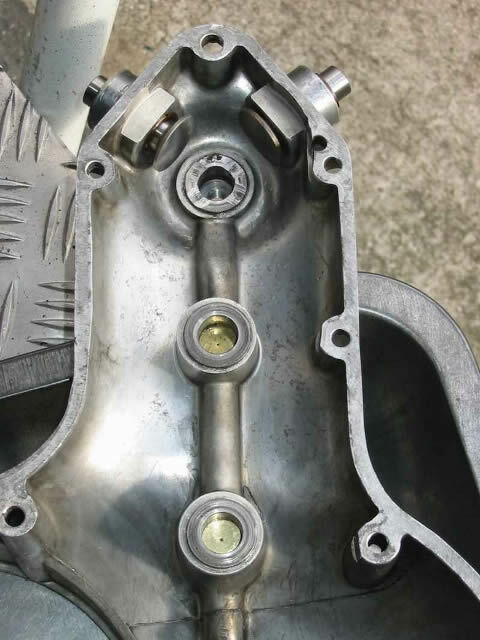 I have seen engines where there is barely a dribble of oil reaching the top of the timing cover – feeding any oil to the rockers in this case was little more than wishful thinking & the cam would be barely lubricated. High cam wear has always been “a known problem” with hicams. How much of this reputation is due to poor lubrication I wonder? Losses from the spindle feeds. The spindles slide into loose fitting steel bushes in the timing cover. Sometimes these bushes are loose in the cover & oil will seep out from behind them. A drop of bush fit Loctite cures that or even a good gasket cement if Loctite offends. The fit of the spindle into the bush is critical too. These are static & the spindles don’t rotate so a nice snug should be possible as no wear can take place. If the fit seems slack a carefully applied smear of silicone seal on the shaft when final assembly takes place will make for an oil tight joint. Don’t use a hard setting compound or Loctite here or you’ll never get the cover off again! Now look into the double gear/intermediate spindle bushes in the timing cover at the oil feed drillings – do they look as though they will restrict the feed to the spindles sufficiently? In the covers I’ve looked at they were huge in comparison to the rocker restrictors. Just how much oil does a rotating gear in an oil-bathed timing cover need in comparison to a camshaft or rockers? Another vintage bike engine – the Vincent HRD – uses a very simple metering device to feed oil to its cam gear. A brass disc with a punched metering hole in the middle. It seems the ideal solution for the Parilla too. So in my latest 250 gear drive engine I’ve used just such a restrictor system to force more oil up to the cam. The discs are put in place with a small amount of sealant behind the spindle bushes which are in turn sealed to the cover. The cam will now benefit from an increased supply. It has to be said that the cam itself has a less than perfect sealing system to ensure all oil delivered actually gets to the cam face rather than squirts out either end of the spindle. That’s the next area for investigation….